Boil water and soak noodles for 30 mins. Combine all the ingredients for the filling together to form a sticky mixture. Chop the soaked mung bean noodles into shorter threads and combine with filling. To roll the cha gio, place a piece of spring roll paper on a clean, wet kitchen towel. 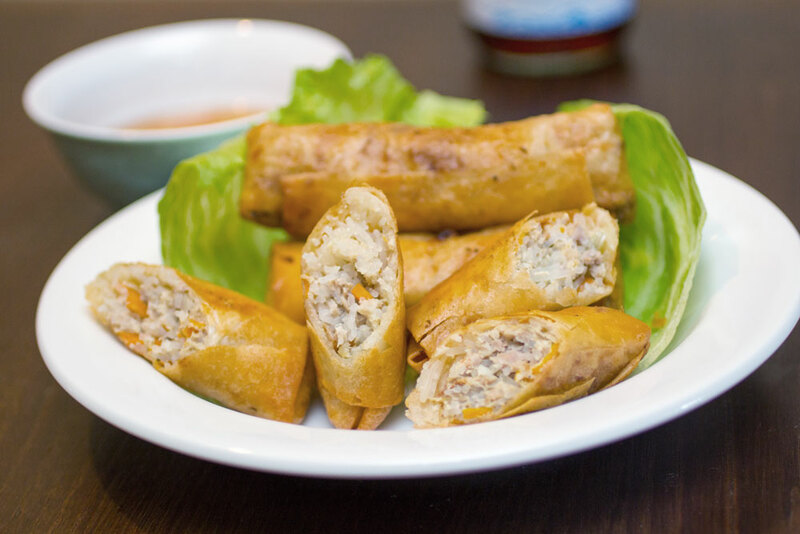 Place 1 heaped tablespoon of filling on the moist rice paper, fold the rice paper over the filling, tuck in the sides, then roll to form a cylinder about 3 inches long. Seal the wrap by dabbing a finger in the corn starch and lining the end of the wrap. Heat oil over medium heat in a wok or a large frying pan. When the oil is smoking, gently place a few cha gio in the oil. Fry them slowly until they turn lightly brown. Drain the excess oil by lining them over some paper towels.